Supports: Excel, CSV files, Infor SyteLine, IRIS, More, Money Manager, Opsis Millenium, PC Law, Pegasus Opera I, Quickbooks, Sage, SAP, Solar, Tally, TAS Books, VT & Xero. Neilson James Technology (NJT), based in South Manchester, is a provider of software applications and a wide range of IT support services. NJT has extensive experience in the development of customised Microsoft Office based applications. In particular, development of Excel based applications that interact with accounts software. NJT also possesses a wealth of operational, technical & project management experience within Government agencies & the IT industry spanning over 3 decades. This includes the Magistrates' Courts Service and commerical software suppliers. MTD for VAT became effective on 1st April 2019. This means, Taxpayers with a turnover above the VAT threshold (currently £85,000) have to keep their records digitally (for VAT purposes only), and Provide their VAT return information to HM Revenue and Customs (HMRC) through MTD compatible software. Although HMRC has stated that some of the more complex businesses will not be mandated until October 2019. However, there will be a 'Soft Landing' period for at least 12 months, from the date of mandation, whereby HMRC will not impose financial penalties against those Taxpayers that do not fully comply with the legistlation, specifically, the digital links (See rule 3 below). For information, HMRC currently has no plans to introduce a mandatory requirement to submit transaction level data (Supplemental information). Therefore, Taxpayers only need to submit VAT Returns that contain the 9-box totals. For information, MTD for Income Tax will not be mandated until 2020, at the earliest. Terminology: Throughout this website, the generic term 'Taxpayer' covers to all types of Taxpayer, including Businesses and Individuals. 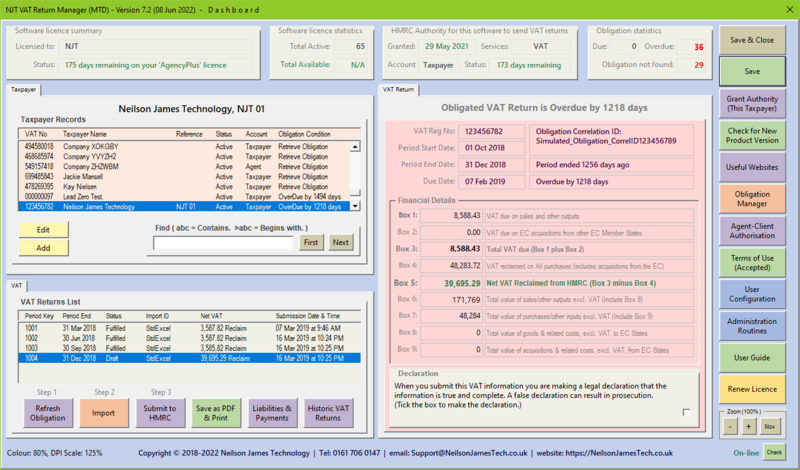 NJT offers a 'Bridging' software solution, named the 'NJT VAT Return Manager (MTD)', for submitting MTD compliant VAT Returns to HMRC. HMRC refer to this as 'Bridging software' as it's function is to provide an MTD compliant digital link between your accounting software and the HMRC system. Excel, CSV files, Infor SyteLine, IRIS, More, Money Manager, Opsis Millenium, PC Law, Pegasus Opera I, Quickbooks, Sage, SAP, Solar, Tally, TAS Books, VT & Xero. Please Note: Additional systems will be considered on a request basis. However, Systems will require the facility to export VAT Returns to either a Text based file or an Excel file, in a consistent format and layout. For further information see the 'View the minimum system requirements.' link below. [Click here] View the full list of currently supported accounting systems & formats. [Click here] View the full software prices list. [Click here] View the main features. [Click here] View the minimum system requirements. [Click here] How to purchase (Businesses with a single VAT account). [Click here] How to purchase (Businesses with multiple VAT accounts). [Click here] How to purchase (Agents that submit on behalf of clients). For information, before you can use the 'Live' bridging software, you first need to sign up to MTD. This is because HMRC require that you 'Grant Authority' (Authorise the software), using your MTD account. Consequently, it is difficult to obtain a practical understanding of how the 'Live' software works, prior to siging up to MTD. NJT has therefore developed 'Free' demonstration software, named the 'NJT VAT Return Demo (MTD)', that simulates the 'Live' bridging software. This demonstration software allows you to simulate the full 'End to End' process without being signed up to MTD. This is a perfectly safe method to familiarise yourself with the functionality of the 'Live' software without actually communicating with HMRC. Additionally, you may wish to use this software to assist in training or to improve understanding of the required processes under MTD. [Click here] for more details. There appears to be some confusion amongst certain circles regarding both the Acceptability and Lifespan of Bridging Software. For the avoidance of doubt, the HMRC VAT Notice 700/22 (see link below) explicitly defines Bridging software as 'Functional compatible software' and is therefore a perfectly acceptable method of submitting, MTD compliant, VAT Returns to HMRC. Bridging software is NOT just an interim solution as some people are advocating. The VAT Notice defines 'Functional compatible software' as a software program, or a set of software programs, products or applications. Therefore it is perfectly acceptable to use one software program to keep your accounts records (This includes spreadsheets) and a separate software program (Bridging software) to submit your VAT Return. The only stipulation is that you must transfer the data digitally. The confusion is actually related to the rules governing the transfer of data between the accounts software and the Bridging software (Digital Links). Again for the avoidance of doubt, the NJT Bridging software supports the, MTD compliant, digital transfer of data from a variety of accounts software and formats. HMRC is adopting what is called a 'Soft Landing' for a period of 12 months from the date of your mandation, during which you are allowed to transfer data manually. For example, if you are mandated on 1st April 2019, then you must transfer data digitally from 1st April 2020. Accounts Records: Your accounts records must be kept digitally for Tax purposes using 'Functional compatible software'. This includes all transactions that are required to calculate the 9-box totals in your VAT Return. For information, records kept within Spreadsheets are classified as digital records. VAT Returns: Your VAT Return must be submitted using 'Functional compatible software'. This can achieved using a single integrated software solution or a separate Bridging software solution. HMRC only requires your VAT Return submission to include the 9-box totals (Not the transactions). For information, HMRC has no current plans to introduce a mandatory requirement to submit transaction level data (Supplemental information). Digital Links: Following the 'Soft Landing' period, all data must be transferred digitally between 'Functional compatible software'. Exporting & Importing digital files, for example, (Text, CSV & Excel files) are all acceptable. Linked cells in spreadsheets are acceptable. The emailing of Digital files between the different software applications is acceptable. The use of 'Copy & Paste' is only acceptable where controlled by the software (For example, via buttons). Manual entry of data is not acceptable, unless for purposes outside the scope of MTD. However, the data must be transferred digitally. Initial high-level development has commenced to provide a solution for Self Assessment Tax submissions. A Demonstration version is planned for release during the summer of 2019, subject to the availability of the necessary finalised HMRC technical documentation. Initial thoughts indicate that a new combined solution will be developed, covering both VAT and Self Assessment. For information, HMRC has announced that the live MTD Income Tax system will be mandated no earlier that 2020. The first mandated phase is 'Self Assessment', which will include Self-Employed 'Businesses' and Self-Employed 'UK Property Businesses'.